These are really cool looking. The pad is a lot more tan than pictured. The only thing that caused these to not get 5 stars is that they are really skinny. A larger person couldn’t sit in them.- Update it will take two people to put this together and be prepared to wrench on it for awhile. It is very small In 5’5 , 150lbs and I barely fit. My husband who is 6’4” 220 looks like he’s in a child’s chair. Our Outsunny chaise lounge was designed with one purpose in mind; you'll discover that purpose the first time you try it. It's all about relaxation and the pleasure you experience from sitting in something that's built for comfort. Whether you're poolside soaking up some rays, or reclining under a tree in the shade, your body will thank you for that easy and tranquil feeling. Don't spend another minute sitting in your outdated and back-breaking outdoor furniture. Upgrade to an Outsunny chaise lounge and spend your summer days in the finest way possible. Dimensions 71.0 In. X 26.0 In. X 35.0 In. We purchased two of these chairs and they both came defective! Don’t bother with these! Small for full size person . Flimsy plastic connectors that are used to anchor moving back to base. I am 5 foot 10 inches and take up the whole length of chair. 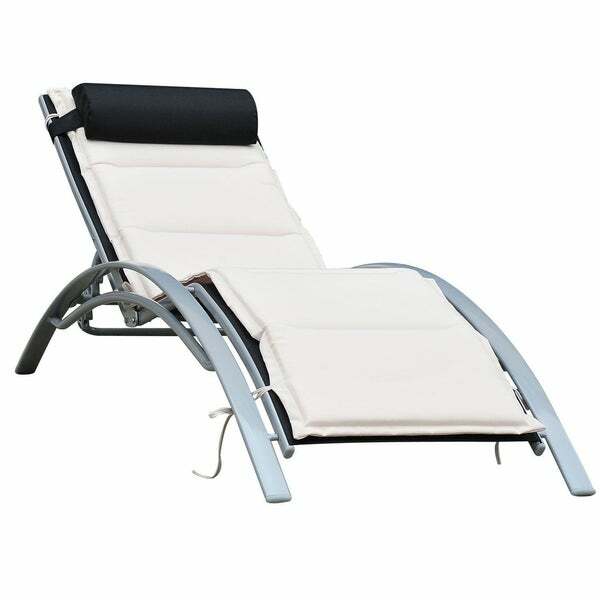 Great price for aluminum with cushion, reclining headrest and zero gravity design for comfort. Was looking for an adjustable chaise with a larger weight limit and saw this. Hope it is as nice as it looks.